The characters on "Abby's" are upset that the Chargers left San Diego. They know what birds fly in the canyon behind their South Park homes and they hit up Sombrero's Mexican Food. 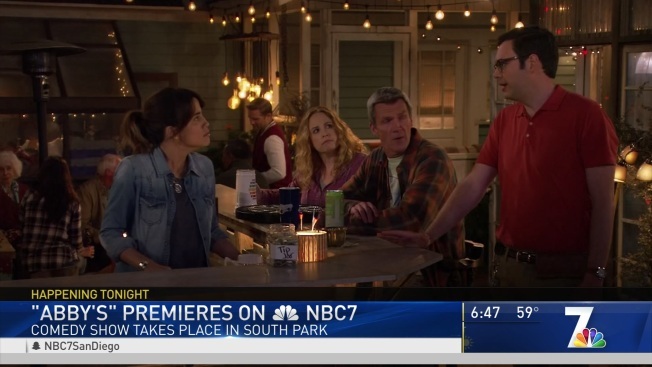 NBC's newest multi-camera comedy, which premieres Thursday at 9:30 p.m., is set in San Diego's South Park neighborhood and promises to be filled with familiarity for locals, even while the rest of the world may not be in on the joke. "I learned of the existence of Mission Gorge Road. Is that a real thing?" said Neil Flynn, who plays Fred, the older patron of Abby's bar and father figure to the title character, portrayed by Natalie Morales. The series -- co-created by Torrey Pines High School alumni Josh Malmuth -- centers around Abby (Morales), a Marine veteran who decides to open an illegal bar in her San Diego backyard after her return from serving two tours in Afghanistan. The neighborhood spot draws an unusual cast of characters, from the neurotic landlord Bill (Nelson Franklin) to less-than-intimidating bouncer James (Leonard Ouzts). In the pilot, Bill discovers the illegal bar but with some coaxing from the bar patrons, agrees to let Abby keep the bar, as long as she makes a few changes. Malmuth, whose previous credits include Fox's "New Girl" and NBC's "Superstore," grew up in the Del Mar area and thought that this wonderful, albeit at times "strange" city, would be the right location for his cast of characters. "He has made sure that San Diego has become one of our co-stars at the bar," said actress Jessica Chaffin. None of the actors on "Abby's" are from San Diego, or even have much knowledge of America's Finest City but they're learning, actress Kimia Behpoornia said. "We also are mad about the Chargers," she adds. "Furious about the Chargers," Franklin agreed. The comedy is the first multi-cam show to be shot outdoors and in front of a studio audience. The show is filmed on Wisteria Lane in the Universal Studios Backlot; Abby's backyard-turned-bar used to be part of the "Desperate Housewives" set -- Eddie Britt's (Nicollette Sheridan) home. Franklin said it's because of San Diego's laid-back vibe that a show set entirely in a backyard works so well. "The vibe there is what I think lends itself so well to the show," he said. "Everybody’s relaxed, this is like true Southern California and there’s no judgment at this bar." Malmuth said that the characters in "Abby's" will be relatable to everyone but hopes that the show's authentic San Diego style especially appeals to locals. San Diegan's can watch Abby's 10-episode run every Thursday at 9:30 p.m. PST on NBC 7.